MPECS Inc. Blog: System Builder Tip: Order Intel Xeon 3000 server products!!! 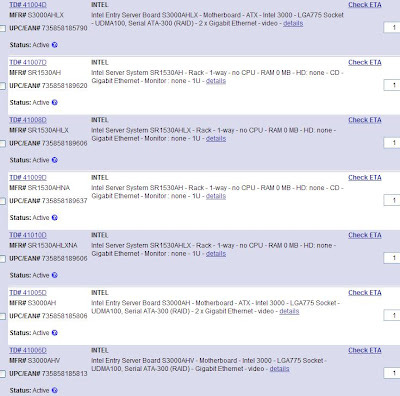 System Builder Tip: Order Intel Xeon 3000 server products!!! 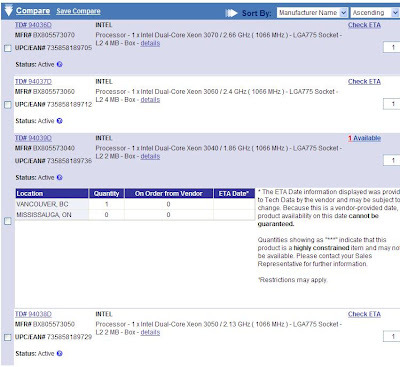 Can anyone tell me why the heck Canadian distribution seemingly has an aversion to Intel's new 3000 series Xeon product?!? Man, this is getting really frustrating for us System Builders who want to quote and build solutions that have more horsepower for less power consumption along with great product longevity for our clients! Nada, nothing, zippo, zilch... you get the picture. Wow! One! In Toronto. That means that it is a week away and an additional charge for those of us in the West due to it not being stored at our "Default" warehouse that is out West. Now, on to the 3000 series Xeon CPUs. These guys show stock on a couple of them. Notice that they are not carrying the full line? We have been burned by this particular supplier. Once bitten, twice shy right? Well, we do have a three strike rule. So, a long time after the first fiasco, we tried them again. Guess what? "Oops, we did it again". :( Thus, do we risk it for our third try? Not too sure if we are willing to go there yet. Virtually no stock, and none on the way! One in Vancouver though ... so a little bit better as that is our default warehouse with these guys. In a country of over 33 million people whose economy is driven in a good part by small business, there has to be some sort of demand for the newer Intel 3000 series products? As I see it, distribution is trying to keep us buying Pentium D and the SE7230NH1 server board as they all have lots of stock on them. The SE7230NH1 is very dangerously close to the end of the product cycle. The Pentium D is okay for small server setups. The Xeon 3000 series, which is essentially a rebranded Core 2 Duo, gives us a CPU that has way more capabilities for less power consumption. On that note, Canadian System Builders: Buy Intel Xeon 3000 Series server product! The more we buy, the more it forces Distribution to stock the product. When we are in situations where we can provide a 3 to 6 week lead time, back order that product! Also, talk to your Intel Rep. Let them know how difficult it can be to get 3000 series Intel server products. Make sure to talk to your distribution contacts as well. Let them know that you are frustrated with the lack of stock. We have mentioned it on many occasions to our primary distribution point. How can we sell that which we do not have?